The first hint of an outdoor concert location appeared in the Redlands Citrograph September 24, 1904. “Recent band concerts have awakened such interest that it is proposed to build a band stand in Smiley Park between Eureka and Grant Streets.” City trustees quietly discussed the matter and suggested concerts given weekly throughout the year with tiers of seats erected for the audience. The matter lay dormant for five years. celebration in 1914 at the new location. Dueling concerts at both the Sylvan Park bandstand and The Bowl throughout the 1920’s cemented Grace Mullen’s Community Women’s Chorus and later Community Music Association to pressure the City Council to build a larger facility. The first Redlands Community Sing July 3, 1924 followed by “Hollywood Night” August 8, 1924 demonstrated a community support for the arts and music appreciation. An amphitheater sketch in 1926 by Los Angeles architect, E. Voellmy, estimated a new shell might cost $5,000 but do much to beautify The Bowl. Mrs. Mullen proposed a music and park tax levy, supported by the City Council. Levying 5 cents for music and 10 cents for parks, Redlands voters answered the proposal in June 1926 sending the tax to defeat by a two to one margin. The City of Redlands bought the aging Wyatt Opera House for $8,000 but was forced to condemn the structure in 1928. This was a blow to the Community Music Association, dramatic groups and Redlands High School lost a commencement building. Clock Auditorium was built in 1928 solving some of the issues but an outside forum was always the dream of Grace Stewart Mullen. She believed music and the arts should be free and open to the masses. Music, she said, reaches all our collective souls bringing insight and appreciation for life. In May 1929, Clarence G. White and his wife, Florence, proposed to the City Council to give new beautiful concrete amphitheater. Mayor Allen Wheaton and the City Council had been briefed before the May 15th meeting and came prepared with many heartfelt expressions of collective gratitude. 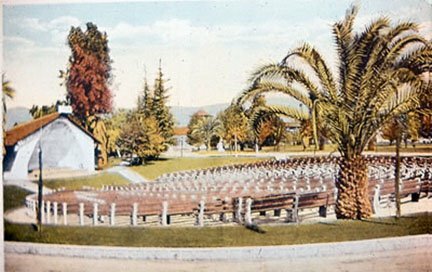 The White’s were impressed with how The Bowl amphitheater played such a role in the life of Redlands citizens. Musical events, gatherings of a patriotic nature, civic nurture and high school commencement were all held there. Permission for the project was given allowing the White’s the freedom to manage the project until completion. Clarence G. White was an industrialist and owner of the White Truck Company and White Sewing Machine Company. He hired Herbert F. Powell of the firm of Marsh, Smith and Powell of Los Angeles to complete the plans. Herbert Powell graduated from Redlands High, University of Redlands 1920 and Harvard Architectural School. Powell’s designs were made to compliment the architecture of A.K. Smiley Public Library. The Italian Renaissance concrete shell was also influenced by the flavor of Classical Roman archways extending in both directions from the stage center arch. Red tile roofing matched the library. Macdonald and Driver, Los Angeles contractors offered the lowest bid of $20,000. By the time the city permit was pulled Clarence and Florence White had amended the plans with additions to make their gift worth more than $35,000. The White’s chose the name “Prosellis” or “before the seats” to further the allure of this unique city treasure and thought the Greek name alone would conjure more interest in the arts. Powell’s plan provided for a band instrument room, piano room, women’s and men’s dressing rooms, and storage features built in the back of the shell. The large rear door was designed for easy installation of pianos or an organ. Two smaller dressing rooms were for future “stars’ to use. Merrell Gage, professor of sculpture at USC, created the artistic stonework. The central diorama depicts three original figures to represent the various activities, which take place at the Prosellis. Another sculpture presents three triangles representing the mountain peaks of San Jacinto, San Bernardino and Mount San Gorgonio. The remaining scrolls depict much of plant an animal life, and the crops indigenous to the area. Mrs. Florence White provided the north side prayer: Work to keep us going, Joy to match our sorrows, Thought for a goodly sowing, Hope for a new tomorrow. Work progressed beginning in the fall of 1929 until completion in April 1930. So important was the dedication that two ceremonies were held. Dr. Victor L. Duke, President of the University of Redlands, led a dedication in the afternoon of April 29, 1930 and Henry G. Clement, Superintendent of the Redlands School District, reigned over the evening. Arthur Gregory, first band stand builder, George P Cortner, the new mayor, Herbert Powell, architect, Merrell Gage, sculptor, A.E. Isham, representing the city at large, Rev. William Cowans, President of the Ministerial Association, and Mr. and Mrs. White were among the speakers for the dedication. The Prosellis inhabitants begin with the decades serving Community Sing Directors, Gage Christopher, Hugo Kirchhofer( 1925-1955), Wilbur “Pop” Schowalter (1955-1977), and Curtis Allen Sr.(1980 to present.) Redlands Community Music Association Presidents, Grace Mullen 1923-1967 and Conant Kincaid Halsey beginning in 1967. Ruth Grinnell Fowler was the pianist between 1924-1974. Harriet Talbert and Kim Hoeptner alternate as accompanists in the summer season. Musicals, operas, symphonies, orchestras, bands, ensembles, dancers, and numerous musicians have graced the stage. Hundreds of actors from three generations of Redlanders have performed and entertained us. Thousands of Redlands seniors have attended Baccalaureate and commencement exercises for nearly 90 years. And hundreds of thousands have attended Community Music Association programs fulfilling the dreams of Grace Stewart Mullen and reminding us of the philanthropy of Clarence and Florence White. The Redlands Area Historical Society wishes to recognize this cultural accomplishment and recognize how the legacy of visionaries continues to enrich our lives.